"This book is a manifestation of the subtle energies of the chakras. 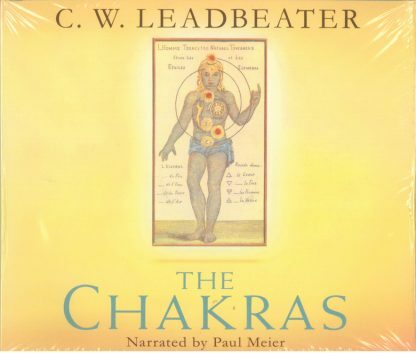 C. W. Leadbeater began that journey as a trailblazer for the rest of us. The Chakras is his treatise, an important work that shines like a beacon, letting us know how much more there is to see and learn in the subtle world." Chakra (Sanskrit, "wheel") refers to the ancient Hindu concept of seven vortices of energy located on the spine from the tailbone to the crown of the head. These centers define the physical and spiritual contact points in the human body. In yoga they are bridges to higher consciousness symbolizing the journey from the material world to the divine. Alternative-medicine healers recognize them as a dynamic resource for health. The book has sold hundreds of thousands of copies and remains a classic. The new material by Anodea Judith and Kurt Leland emphasizes its relevance for today. This is a 4-cd pack. Charles Webster Leadbeater (1847-1934) was a Church of England clergyman until he joined the Theosophical Society in 1883. He spent some years in Sri Lanka working for the revival of Buddhism, and later became the Presiding Bishop of the Liberal Catholic Church, which seeks to combine the preservation of the Catholic sacraments with the widest measure of freedom of thought and interpretation of the scriptures. He was a highly developed clairvoyant and the author of over thirty books on the spiritual life and on the psychic nature of man. He unfolded and perfected his own psychic faculties under the guidance of his Adept teacher and in 1893 began his clairvoyant investigations, on occasion collaborating with Annie Besant, the second President of the Theosophical Society. His worldwide lectures presented a new viewpoint to thousands of people. Paul Meier has recorded nearly fifty audio books, including The Bhagavad Gita, A Christmas Carol, The Curious Case of Benjamin Button, and Ayn Rand's famous novel Anthem. The Owner and founder of Meier Dialect Services, Paul is also the founder/director of the International Dialects of English Archive (IDEA). Kurt Leland is the author of The Multidimensional Human. He is a national lecturer for the Theosophical Society in America and a Boston-based classical musician and award-winning composer, and he maintains a consulting and teaching practice called Spiritual Orienteering.